One of the best things about a trip to Vegas is all the fantastic food! It seems like every hotel and resort offers its own buffet. From prime rib to sushi and breakfast to dessert, Vegas buffets have something for everyone. If you’re not careful, you could end up spending a fortune trying to hit them all. The Buffet of Buffets pass is a sweet deal that gets you unlimited access to five different buffets in Las Vegas within a 24-hour period. How Much Does the Vegas Buffet of Buffets Pass Cost and How Does It Work? A Buffet of Buffets 24 Hour Pass is gives you access to the participating buffets for as many visits as you like during a 24-hour period that starts when you buy the pass. In general, most of the buffets are open from 7AM until 10 PM, but the hours for each buffet will vary by day and location (See our chart of buffet hours). You will still have to wait in line at each buffet to get a buffet receipt from the cashier unless you purchase an Express Line Pass separately at each location. Where Can I Buy a Vegas Buffet of Buffets Pass? 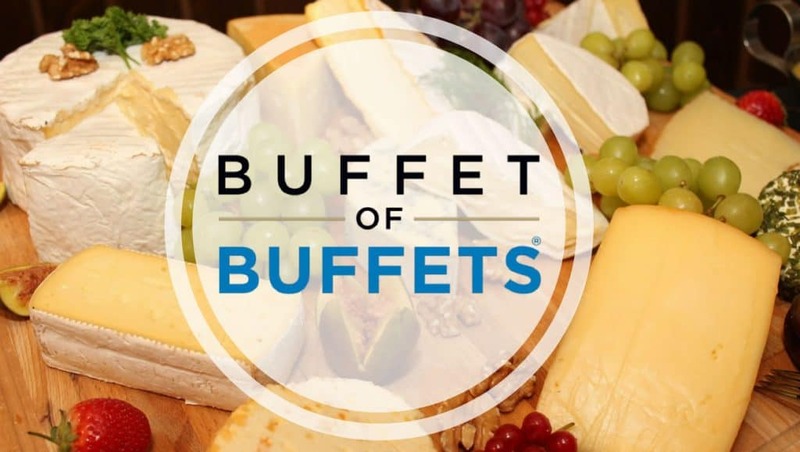 You can buy a Buffet of Buffets Pass at the cashier station of any of the participating buffets or at participating Total Rewards Centers. If you’re a Total Rewards member, you save $10 on the cost of the pass. You can also buy a Hotel Room & Buffet Package that comes with free 2 Buffet of Buffets passes. You must be booked for two or more nights at one of the participating hotels to get this deal. Is Buffet of Buffets Worth It? Absolutely! Let’s say you had the breakfast buffet at Paris Las Vegas for $21.99, the lunch buffet for $24.99, and the dinner buffet for $30.99. In this scenario, you’ve already spent about $78 for only 3 meals at the same buffet. You could have saved about $18 by purchasing the pass, and you should be able to squeeze in a fourth meal, too (more on that below). Here are some strategies to help you get the most for your money. Purchase your Buffet of Buffets pass at dinner time right at the door to the restaurant as you’re going in. This way, you can get two dinners on the same pass. Have dinner at 7PM the first day and make sure you’re through the cashier’s station for dinner before 7PM the second day. Hit the most expensive buffets to get the most for your money. That means Rio for breakfast, Planet Hollywood for lunch, and Paris for dinner. That’s a $75 value for your $60 pass, not including a second dinner if you time things right. If you want to try every buffet, you could go from buffet to buffet and just have your favorite things from each. Try some crab legs at Planet Hollywood, BBQ at Harrah’s, and dessert at Paris… you get the idea. This strategy will take more time, but it’s a good way to get the most for your money. What Buffets are Included in the Buffet of Buffets Pass? The Paradise Garden Buffet puts out a fabulous brunch buffet that’s available from open to close every day. Breakfast offerings include everything from made to order omelets, breakfast sandwiches, and crepes. If you are more in the mood for lunch, there’s a complete salad bar, mouthwatering burgers, and Cajun and Southern-inspired dishes. Or, hit the BBQ dinner buffet on Friday and Saturday nights from 5-10pm. The BBQ buffet features classic American favorites like smoked beef brisket, crab legs, slow-roasted prime rib, and Louisiana seafood boil. Don’t’ forget to save room for an amazing dessert or two! The lavish Spice Market Buffet takes you on a world tour all in one meal. You’ll find delicacies from the Middle East and the Mediterranean as well as Mexican, Italian, Asian, and American selections to please every member of your group. There are even some delicious vegetarian options, including two full salad bars, grilled vegetables, and hummus. Some of the most popular menu items are the stuffed seafood sole and the Tandoori skewers. There are plenty of tantalizing desserts to end your meal, like cotton candy, cakes, and cookies. If you can’t decide what you’re hungry for, this is the buffet for you! The Casual Flavors Buffet has an endless selection that will please everyone in your party. Choose from pizzas from a wood-burning oven, Brazilian BBQ, Italian casseroles, and fire-roasted rotisserie chicken. There’s lots of options for the seafood lover in your group, too. Seafood offerings include succulent shrimp, hand rolled sushi, and crab legs. The dessert area is especially good with everything from Oreo mousse tarts, mini crème brulee, and a chocolate fountain with tons of yummy options for dipping. If you want a little romance on your vacation, The Le Village Buffet is just what you need. This buffet features Paris-inspired dishes in a romantic French village setting with your choice of outdoor seating or cozy indoor seating by the fireplace. Don’t miss dishes include truffle mac and cheese, penne alla puttanesca, and delicate crepes with customizable fillings. If you prefer good old-fashioned American grub, the massive soup and salad bar, prime rib, and snow crab legs will fit the bill nicely. When a buffet has been voted as the Best Buffet in Las Vegas over and over again, you know it’s got to be good. Bacchanal Buffet is a classic buffet that serves hundreds of dishes every day that are created by specialized chefs. You’ll want to fill your plate up with things like rosemary marinated tri-tip, dry rubbed smoked spare ribs, prime rib, chilled crab legs, and oysters. Popular dishes include mini salads and handmade dim sum. Be sure you don’t miss the made-to-order lava cakes and homemade gelato for dessert. This buffet requires a $25 upgrade for brunch, and a $35 upgrade for dinner, but it’s well worth it! Check out our full review on the Bacchanal. This buffett has a casual atmosphere that’s perfect for families and offerings include more than 300 selections from around the world. You’ll find everything from pizza to omelets and Mexican to Japanese specialties for every taste. Choose from a variety of more than 70 different desserts that include homemade pies, cakes, pastries, and house-made gelato. This buffet requires a $25 per visit upgrade on your Buffet of Buffets pass. I personally don’t think this upgrade is worth the extra money. You can easily find comparable seafood at other buffets on the Strip without the upcharge. The Buffet of Buffets Pass is a great deal. With a little planning, you can get four all-you-can-eat meals for about the price of one buffet dinner in Vegas. How can you beat that?